When Muppet fans Walter, Gary, and Mary discover that Muppet Studios is going to be torn down, they embark on a mission to reunite the Muppets to save their legacy. Can the Muppets go back to their roots and find a way to steal America's hearts again? I've always been a huge fan of the Muppet Show! When I was younger, I had an old episode on VHS and I watched it over and over again. I now own season one and I watch it regularly! The Muppets' timeless humor makes people of all ages enjoy it. In light of the new ABC show's release, I thought it would be fun to go back tho their first movie made by Disney. The movie begins with Walter (a puppet) and Gary (a human), twins who live together in Smalltown. Walter and Gary do everything together. When Gary plans a visit to Los Angeles for his girlfriend, Mary, Walter goes along too, much to Mary's dismay. Mary feels like she can never have a meaningful relationship with Gary because Walter is always around. While on their trip, the three visit the old Muppet Studios to find it in shambles. When Walter is exploring Kermit's old office, he overhears that the place is being torn down to make way for an oil drilling. Walter, in shock, tells Gary and Mary, and they decide to find the old Muppets and raise money to buy the studio back. First, they find Kermit living in his broken down mansion. Kermit is upset when he hears the news but doesn't know how to get the Muppets back together. The three convince Kermit to save the studio, and he finally gives in. They find Fozzie, Gonzo, and Animal, then find the rest via a montage. Rowlf is upset that he wasn't featured because his recruitment was "exciting," meaning they woke him up from a nice nap on a hammock to join. Last of all, they venture to Paris to find Miss Piggy working for Vogue. She refuses to join the Muppets, so they replace her with an impersonator. 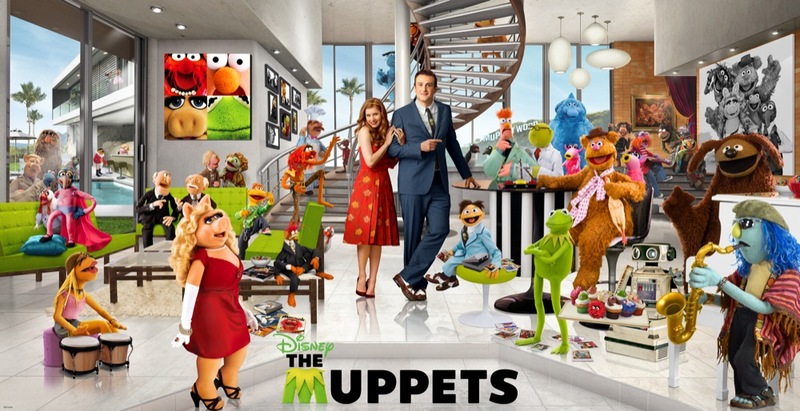 The Muppets pitch their show to several networks, being rejected each time. They finally get accepted when one network's top program was cancelled, allowing for another show. They then get to work restoring their old theater. Their first rehearsal utterly fails, and Kermit cannot find a celebrity guest. Miss Piggy "rescues" them, in a sense, and kicks the terrible Miss Piggy impersonator out. After a failed attempt at begging the oil baron to give them their studio back, the Muppets decide to kidnap Jack Black, Animal's old anger management sponsor, and use him as their celebrity guest. Just as things begin to look brighter, Mary causes Gary to make a decision: does he love her or the Muppets more? This movie was cute, but not quite as good as the originals. You could see that Disney was making an effort, though, which I appreciated. It is very much targeted towards children, which often Disney forgets to do. ☺ I'm sure that this is a movie that children especially will appreciate.